In a surprise announcement today Microsoft and Turn 10 Studios have announced Forza Horizon 2 Presents Fast & Furious for Xbox One and Xbox 360. A standalone expansion set before the movie which pits you as a driver in France who must source vehicles for mechanic Tej Parker, portrayed by Chris “Ludacris” Bridges in the films and game. Forza Horizon 2 Presents Fast & Furious does not require the base game to play, is out 27th March and will be free until 10th April to promote the 3rd April North America launch of Furious 7, the latest film in the series. After 10th April the expansion will cost $10. Microsoft have not relesed UK pricing yet. Xbox and Universal Partnerships & Licensing have announced an unprecedented partnership to bring a unique, interactive, and exclusive experience to millions of Xbox fans worldwide. For the first time ever, the thrilling driving and amazing cars of Forza are combining with the unstoppable “Fast & Furious” movie franchise to create an original adventure filled with high-speed automotive action in Forza Horizon 2 Presents Fast & Furious. If you don’t own Forza Horizon 2, don’t worry: This is a standalone, open-world expansion. Forza Horizon 2 Presents Fast & Furious puts you behind the wheel of more than 11 iconic vehicles from the “Fast & Furious” films – including some exciting new cars from the upcoming “Furious 7.” Included are cars from the movies, such as the 1970 Dodge Charger R/T driven by Vin Diesel’s character Dominic Toretto. 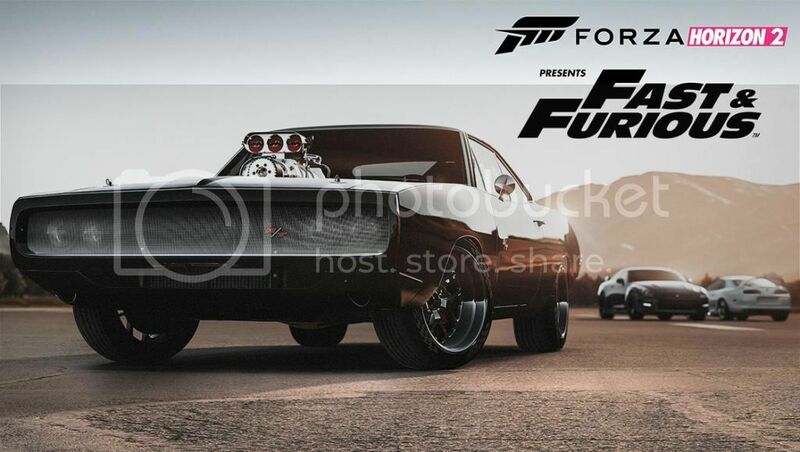 Cars from Furious 7 also in the game include a 1998 Toyota Supra, 1970 Plymouth Road Runner, 2012 Nissan GT-R, 1970 Plymouth Cuda, 2013 Jeep Wrangler, 2014 Maserati Ghibli S and 2015 Dodge Charger. By completing various challenges you’ll be able to unlock the new cars for free roam play. In Forza Horizon 2 Presents Fast & Furious, you’ll be recruited by Fast & Furious expert mechanic Tej Parker, voiced by Chris “Ludacris” Bridges, to source cars for the Fast & Furious crew’s next big mission. You’ll take part in a series of thrilling car challenges set in the idyllic south of France, and inspired by both the “Fast & Furious” movies and Forza’s awesome, pulse-pounding gameplay. As you complete game challenges, you’ll unlock new cars that you can drive throughout the open world in free roam play. You’ll also be able to take photos of your favorite cars and share them with fellow Forza players via the official Forza website and the Forza Hub app exclusively on Xbox One. To celebrate the April 3 theatrical launch of “Furious 7,” the expansion will be available at no charge for a limited two-week period. Players can download the expansion on Xbox One or Xbox 360 (at no charge!) from March 27 through April 10; after this, the expansion will cost $10. Players who downloaded it during the initial two-week window can continue to play without restriction. From a very young age I have been welded to a PC or a console of some description. My love of gaming goes all the way back to the the early 80's when my Dad/Head Geek bought himself an Atari 2600 and then a ZX81 a few years later. I can't think of a console I haven't owned but I've been on my Xbox odyssey since 2002 and it shows no sign of slowing down.